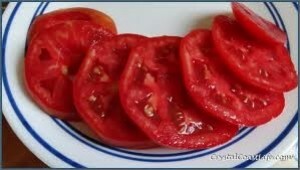 The Big Beef Hybrid Tomato is the finest all-around tomato yet developed for home gardening. 1994 AAS Winner! It is extra meaty with a real "homegrown" flavor, extra large, "beefy" fruit that average 10-12 oz. in most growing areas. Resistant to such diseases as verticillium wilt, fusarium wilt, alternaria stern canker, stemphylium (gray leaf spot), nematodes (root knot) and tobacco mosaic virus. 73 days. 20 seeds per pkt.